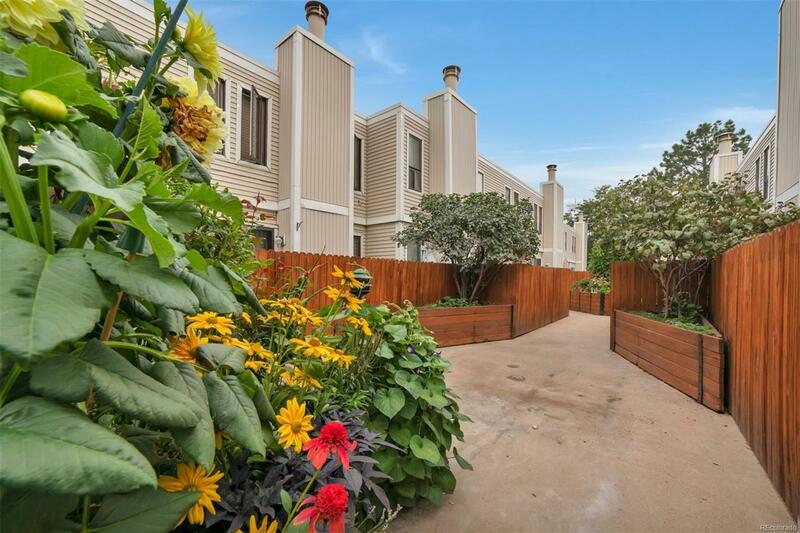 Updated end unit townhome located near grocery store, restaurants, shopping, parks and Cherry Creek Trail in Southeast Denver. Extensive upgrades and new wood flooring throughout the main floor and stairwells. Large open living area with wood-burning fireplace, and looks out onto one of two private patios. The bright kitchen with breakfast area, bar and new stainless steel GE appliances from 2017 opens onto a 100 sq ft grilling patio. Upstairs includes a large master bedroom with large walk-in closet and updated bathroom, and a second large bedroom with an adjacent updated bathroom. A lower floor non-conforming third bedroom is completely finished and large enough for many uses. Lower floor has walkout directly to two underground garage parking spaces. Amenities include pool, fitness facility, and open space in complex.